Are you looking to build a Binary MLM Software for Network Marketing Business? Well that would be a really great idea! If your network marketing company pays out its compensation in the Binary MLM format, then using of a Binary MLM software would be really a complementing factor for your business. How Binary MLM Compensation Plan Works? A Binary Compensation Plan follows a two legged structure. They are called the Left Leg, and Right Leg. Here every new MLM agents are added in either the right or left subtree. When one subtree is called a Power Leg or Profit Leg, then the other leg is called either a Profit Leg or a Weak Leg. Whereas, a Binary MLM software is a web application which makes the managing of entire network marketing business smooth and easy. It helps to generate reports, calculate commissions and much more. 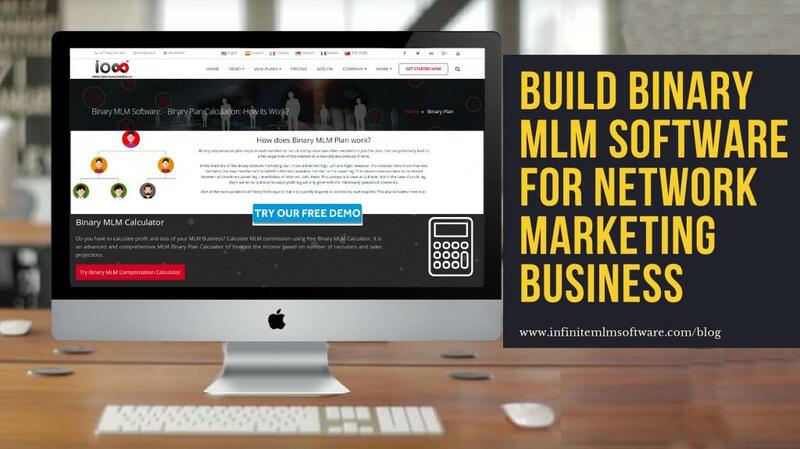 In short, they helps to reduce the manual works done by MLM companies and it suits for all kinds of network marketing companies whether they are small or big. In a binary plan, each member should recruit or sponsor a minimum of two new members. And this results in the fast expansion of the Genealogy tree in a short span of time. In the first line of the Binary Plan, there will be basically two legs, the Left Leg and the Right Leg. And if a person recruits more than two members, the third member he recruited will be placed under the available slot in the Power Leg. And this process is called Spillover. And the process of spillover allows a new member to be shared between every downline’s power leg, regardless of the person who recruited them. Incase of Profit Leg, the process of Spillover won’t be there. It’s because the Profit Leg will be expanded only with the individually sponsored downlines. Binary Plan is more of quantity dependent other than level dependent. It automatically induces to recruit new affiliates to your organization. In Binary MLM Plan, you have the advantage of earning additional income from the Spillover of your Upline, since the extra person is placed on the Right Leg. It’s because in Binary Plan you will be having only two frontline distributors. You will be needing to build only your Left Leg, since the Right Leg is already built by the Spillover. You can earn almost the double income than the total number of directs placed under you. Binary MLM Plan has no limitation in its depth, unlike the other plans. Binary MLM Plan grows much faster compared to its allies. This plan is the most favoured one by the start-up companies, since it’s simple to understand. In Binary Compensation model, each and every member will get the most benefit from the new members which are sponsored by their upline in the same leg. Also you will be eligible for extra bonus for the every single person you recruits! Are you an MLM enthusiast working in a company which follows out the Binary Compensation Plan. Well, then take advantage of the one of the best compensation model today itself.